Here’s the best February 2019 $1000 gaming pc build of the month. This build is for those who want the sweet spot in terms of performance per dollar spent, and it just got better with the inclusion of the RTX 12060 graphics card. This build should get you great game-play at 2K resolutions (1440p) and really high-frame rates at 1080p. The $1000 gaming pc build again include an Intel i5 8500 and is now paired with the newer more powerful RTX 2060 graphics card. This is a significant upgrade in performance when compared to last month (previously included was a GTX 1070), and out-performs even a GTX 2070 ti or an AMD Vega 56. Other changes to the $1000 build this month include a better H370 motherboard addition and a switch to the sleek Corsair SPEC-06 RGB pc case. I hope you enjoy the build and if you have any questions or want to stop by and say hi, feel free to leave a comment below! Best of luck building. 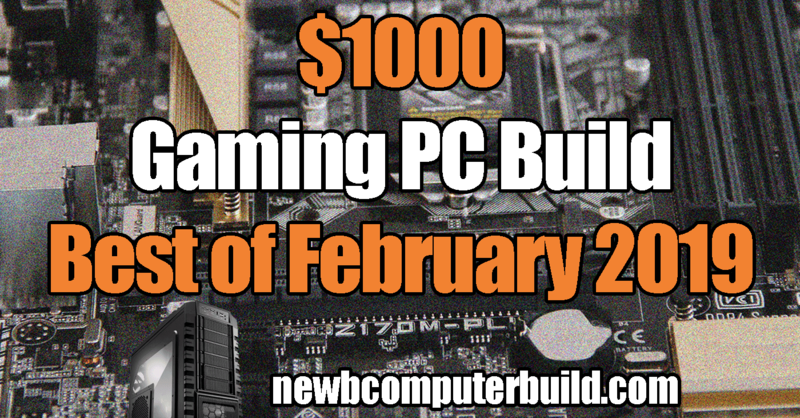 February 2019 Update: The $1000 pc build is more powerful than ever. Newly included this month is a newer RTX 2060 graphics card, which replaces the previous GTX 1070 that held its spot. The RTX 2060 not only performs better than the GTX 1070, but in most instances, it also performs better than a GTX 1070 ti. We also have upgraded the motherboard this month to a better H370 board, and switched the PC case for a Corsair SPEC-06 RGB. The included gaming CPU this February is the Intel i5 8500. This gaming CPU is a great choice and purchase for the cost. If you have a little more to spend on the CPU, check the alternatives tables below where we include the Intel i5 8600K, which will give you more performance should you think you need it. The most exciting new addition this month is the RTX 2060 graphics card. This card is a phenominal upgrade versus the rpevious GTX 1070 card that held this spot — outperforminf not only the GXT 1070, but in most instances even a GTX 1070 ti GPU. The RAM kit included is a Corsair LPX 8GB DDR4 RAM kit which is enough memory for most gaming pc builds, and you always have the option to upgrade more in the future if need be with the extra couple of slots on the included gaming motherboard. The storage included is a modest Western Digital Blue 3D Nand SSD 500GB SSD. This SSD is priced really well and is a must for any pc build. You can also upgrade this SSD for a 1TB version or add more later when needed. The power supply unit (PSU) included is the EVGA Supernova 650 Pw 80+ Platinum PSU. This is enough juice to power this awesome pc build and is a platinum rated PSU, which make it very efficient at doing so. The new pc cases included for February 2019 is the CORSAIR CARBIDE SPEC-06 RGB gaming pc case. This pc case is a compact mid-tower with a sleek design that takes advantage of RGB lighting to really pop. There is also a tempered side panel so that you can have fullview of the hardware powering your gaming rig. This case comes in either black or white. Learn more about the complete specification on the Carbide Spec-06 specifications page at corsair.com. CPU COOLER UPGRADE Corsair Hydro Series H80i v2 Extreme Performance Liquid CPU Cooler, Black- Add a liquid CPU Cooler for a quieter, more customized and efficient cooling experience. Above are the suggested upgrade ideas for the best February 2019 $1000 gaming PC build, these are recommended if you have a larger budget or want some upgrade suggestions later on when you need an upgrade. If you wanted to easily upgrade your CPU, you could simply swap for the Intel i5 8600K. 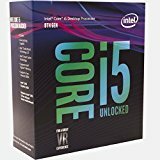 The 8600K gives you the potential to further overclock your CPU for a slightly higher cost. You do have to keep in mind though that if you go with the 8600K, you will need to add a CPU cooler (such as the Cooler Master Hyper 212) and you will need a compatible motherboard (such as the MSI Z370-A PRO above) to take advantage of the 8600K’s overclocking potential. The graphics card upgrade is definietly the first step I would take if you want to get the most gaming performance bump per-dollar spent. The upgraded card is the RTX 2070. So if you have the dollars to spend and want to upgrade this would be a great choice. Since the $1000 pc build above includes 8GB of RAM, you could bump this up further to 16GB with a kit of Corsair Vengeance LPX 16GB 3000MhZ RAM if you think you need it. Further, you could also plug in an additional 8GB kit later on to get 16GB if you find you need it. You could also go with a liquid CPU cooler such as the Corsair Hydro Series H80i V2 in place of the included air cooler already included in the above build above. This could help keep things quiet and a tad cooler when overclocking and it offers a more customize the cooling experience — this could also be used if you decided to go with the Intel 8600K CPU upgrade as it doesn’t come with a cooler.